Abby at West Hollywood Book Fair!!!! Stay tuned and check the WEHO Book Fair site! Come on down beautiful folks to WEHO to celebrate our literary selves. Abby will be reading from Golden Boy, signing beautiful gold hardbacks with her signature gold pen and being all round charming and English (guess who is typing this). SEE YOU THERE LA!!!! Miami Book Fair, here we come baby…!! 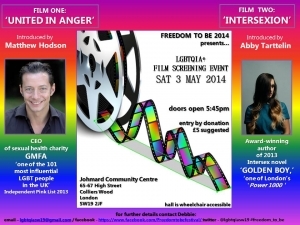 I'll be being interviewed and then introducing Intersexion (dir. Grant Lahood) at this double screening in London. I can't wait to watch the film with you, and also the first film of the night, United In Anger: A History of Act Up. Having just seen How To Survive A Plague, I know it's going to be remarkable. Abby will be discussing gender identity in the 21st Century with YA author Juno Dawson, and UK ambassador for RuPaul's Drag Race, The Vivienne, asking the question: mainstream or minority? Abigail will be appearing on Hoxton radio to talk about her new book, feminist crime thriller, DEAD GIRLS. Abigail will be appearing with host Rosie Wilby on her show on Radio Diva, to talk about her new novel Dead Girls, and Rosie's new book - out now too - called Is Monogamy Dead? Abigail will be appearing on Bunmi Fagbenro's show FIRST BABY, talking about raising girls and her new novel DEAD GIRLS. When her best friend Billie is found murdered, eleven-year-old Thera – fearless and forthright – considers it her duty to find the killer. Aided by a Ouija board, Billie’s ghost, and the spirits of four other dead girls, she’s determined to succeed. The trouble with Thera, though, is that she doesn’t always know when to stop – and sometimes there’s a fine line between doing the right thing and doing something very, very bad indeed. 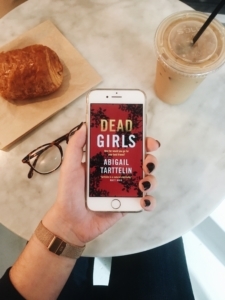 Tense, visceral and thought-provoking, Dead Girls is the new novel from Abigail Tarttelin, the critically acclaimed author of Golden Boy.